Hurry up! There are so many puzzles to solve! 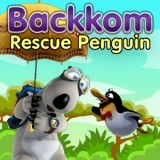 And here you must rescue penguins and just be the best here. Just try to use all the useful things and reach the main goal as soon as possible. Are you ready for that? Then go ahead!